Mohanji recently visited Gurgaon, Delhi, Chandigarh and Jammu in North of India in August 2011. The period from 18-25 August 2011 was full of satsangs, meditations and seva activities in these 4 cities. Selfless activity is dharma towards the society and is essential in the Path of Pathlessness. At every location where meditation was conducted, some selfless activity or seva was also conducted. Many people participated whole heartedly. A separate meditation was conducted for orphan girls of Khushi and Kilkari home in Delhi where around 200 girls along with their staff attended the meditation. Though Sumit from Jammu was the main organizer who put everything together during these 8 days, Shaju, Bindu, Phaneedar, Dana, Smriti, Karan, Akhil, Rajeshwari, Pradeep, Mohanish, Moushami, Aparna, Lavanya, Ravinder, Ajay, Sakshi, …… so many have contributed lovingly and efficiently. Let’s understand about Mohanji’s North India trip from those who attended and selflessly participated to organize the events. Each one has given their unique dimension to Mohanji’s visit. This blog is compilation of their write-up and will take reader through the whole experience in a different way. Sumit says, “I was supposed to write about my ‘personal’experience with Mohanji. Mohanji is my Father. I am totally at a loss of words to do that. How can one describe the essence of Guru Tattva- the timeless principle that travels through eternity and touches one in a given moment? The Guru Tattva is with me all the time. Mohanji has blessed me and I can feel blessings in my very being at every moment- while driving a car, while sitting in the office, while at home with my family, while traveling with Mohanji, while being utterly alone or in the world- He is ALWAYS with me. In such a case, physical proximity holds little relevance. So, it sounds a little absurd to describe what it was to be ‘with Mohanji’. I am ALWAYS with Mohanji. Mohanji is never away from me. When He is a part of you and you are part of Him, then how can you express what it is? It is very, very difficult for me to express. All I can explain are the various incidents that happened while Mohanji was in India this August. All I knew that He is my Father and I am here to serve him during those days of hectic activities, taxing schedules but sublime underlying experiences. Deepali Maa, my spiritual mother, told me about Mohanji’s plan to visit Delhi in August. We had to make use of this golden opportunity. We both decided on 5 locations – Gurgaon, Delhi, girls’ orphanage in Delhi, Chandigarh and Jammu to conduct satsang and meditations. I do not have any experience of organizing anything of this size but had only one desire – to serve my Father (Mohanji) to the best of my abilities at the level of thoughts, words and actions. I was ready and excited because I knew it will be Mohanji who will be serving Mohanji and everything else will fall into place. HE was my courage and HE was my strength. I realize now the only ability that is required is Purity.Everything else just follows that intention. I shared this news with my wife Sakshi. She was very supportive and straight away declared that everything will manifest excellently as Mohanji is coming. She also said it’s an honor of a life time to host Father and asked me to give my best. Deepali guided me at each and every step. 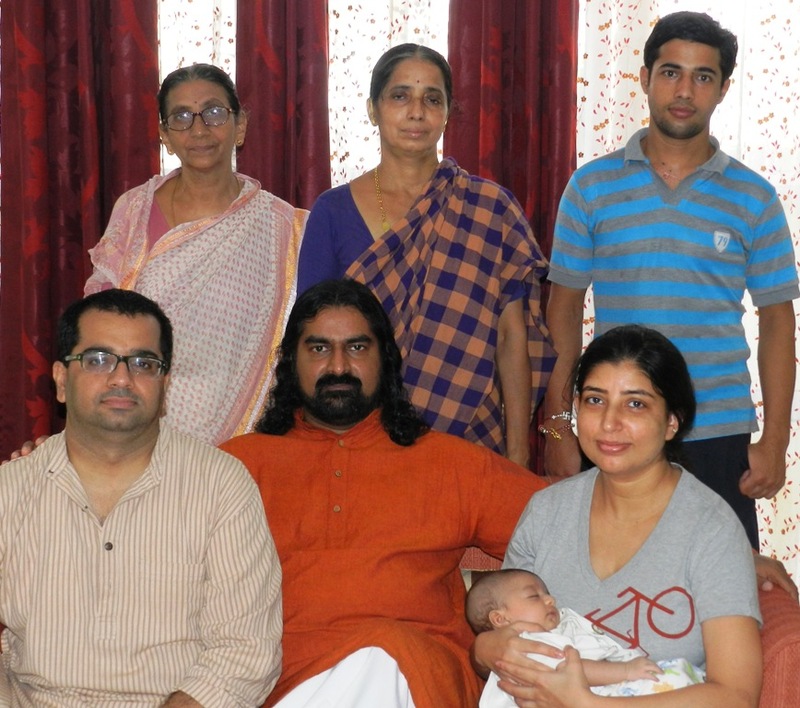 It was the Divine Journey Haridwar–Rishikesh blog, published in September 2010, that proved to be an eye-opener and brought me closer to Mohanji’s consciousness. Maa wrote it very well and included every relevant and minute detail. And here we were, exactly one year after, waiting to live that experience. I shared news of Mohanji’s visit with all the BTW FAMILY members in all three cities. Dana, Phaneendar, Karan, Smriti, Yamini and Bindu didi looked after the preparation and ground coordination of all the venues in New Delhi i.e. The U.R.A.M. Farms Meharauli, The Attic, Cannaught place, New Delhi and Khushi Rainbow Home for girls at Okhla. Aparna, Rati Didi and Puneeta Didi were responsible for the Chandigarh meditation session. Sakshi, Ravinder Singh, Rajesh Gupta, Ashwani Bhasin, Ajay Kher and Umesh looked after the Jammu events. The way Phaneedhar and his family lovingly received Mohanji truly showed their firm will to host and serve Mohanji and all others with Mohanji. Smriti, Karan, and their Family. Karan is still comprehending about 2 pictures given by Mohanji. Karan attended his first BTW session in Chandigarh earlier this year, where he met Sumit for the first time. Karan honestly admits that his mind would not be able to have any connection with Mohanji. But as they started the meditation, Karan had strange but amazing sensation in his body, and right at that moment he received Shaktipat from Sumit. The meditation ended and they were sharing experiences. Karan says, “I shared mine and said that ‘during Shaktipat when the two hands came on my head, I felt as if my whole body was at peace’. I was SPEECHLESS when, with a smile on his face, Sumit clarified that he gives Shaktipat with only one hand! This was when my life turned around, a lot of changes took place in my life – the biggest was that I got my life partner Smriti and we both were there attending the same meditation. For me Mohanji’s visit to Delhi was not a meditation, for me it was a reunion with my soul, my mind, my senses. I can’t call him a Master because he is much more than that. As I said before, it was a reunion after a long separation. To describe my experience was not an easy task because I was short of words to pen down my emotions and feelings, but I have tried my best. About Mohanji’s visit to Delhi, I knew about it from some time and was eagerly waiting for it. With his grace my whole family got the opportunity to serve him by organizing the whole event in Delhi. We all felt so blessed as how Masters choose their people. It was tough to select venues in 4 cities which will be convenient for people to find and yet with energy suitable for meditation. But Mohanji guided in various ways. Mr. Mukesh owns the U.R.A.M. 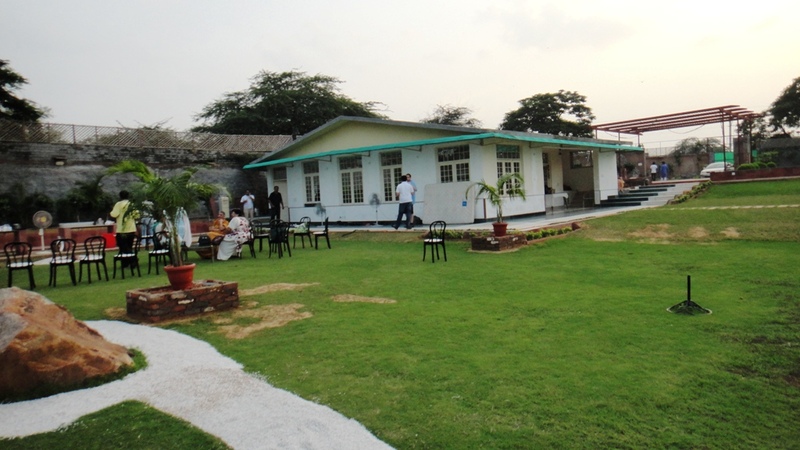 farm house in Mehrauli near Gurgaon. Sumit shared information about the BTW event with Mukeshji and requested him to help in the selection of venue in Gurgaon. When Mukeshji got to know that BTW meditations are open to all with no discrimination whatsoever and are totally free of cost, he immediately offered his farmhouse for this Divine activity. Mukesh Bhaiya told me that his only purpose behind maintaining the farmhouse is to use it for true sattavic activities. He gave his best to get the venue ready as per our requirements with no conditions. Mr. Jitender Grover helped us through his contact to get the perfect sound system for the venue. Each and every person whom I met after meeting Mohanji in October 2010 had a role to play in this Divine Trip of HIS. Aparna has a special miracle to share about venue in Chandigarh – we will come to it later. Shaktipat initiates Pradeep Sukhrani and Rajeshwari came from Dubai and Thane respectively. Mohanish and Moushami came from Pune. Family landed and got together from various locations directly at URAM Farms to be with Mohanji. Mohanji's URAM Farms, Meharauli Delhi. Karan feels that Mohanji had already created a list of people who were supposed to be a part of this Divine communion, and only those could make it! Mohanish writes, “On the 17th of August, our dear caretaker left for her home in Dandeli. Little Moushami and I were left in house. Our luggage was packed. Flight was next day at 7am. We had to leave early, by at least 4am, which meant we had to wake up at brahmamuhurat! What an interesting start for a journey which was about to unfold. But Moushami was a bit worried about us waking up that early. There was no one to wake us up physically. She said, “I am excited and eager to reach Delhi and enjoy the time with Mohanji and our family, but how will we wake up tomorrow? It’s so early!” When she was saying all this I felt a wave of thick/dense and warm energy around me. It was extremely comforting. I said, “Don’t worry. Mohanji will take care.” The alarm was set to ring at 3:00am. We slept around 11:30pm. The moment I closed my eyes some reactions/shifts started happening within my consciousness. Some kind of heavy cleanup was running within. Just like we clean our desktop. One click and all junk is brushed into a single folder! The next I remember is that my eyes opened at 2:50am and I switched off the alarm at 3!! Mohanish continues….. “With grace all around us, we had a smooth journey from airport till the URAM FARMS. Everyone was welcomed by Sumit into the venue. The vibes emitting out of URAM Farm were very comforting. It was like we were inside Mohanji’s belly. He was all around there. Every molecule was interacting with us. It was beautiful. The way Phaneedar and his family received Mohanji when HE arrived, truly showed their firm will to host and serve HIM. Karan feels that Mohanji had already created a list of people who were supposed to be a part of this Divine communion, and only those could make it! There was a couple who was trying to find the place of meditation for a long time but could not. When we came to know what happened, he was amazed. The couple was right in front of the meditation venue gate, wandering here and there, and they crossed the gate and took a wrong turn and never made it to the venue, whereas their son was in front of them in a different car and he made it! Similar story happened with another couple who was supposed to attend meditation in The Attic, Connaughtplace. Two days before the meditation Karan had reconfirmed their presence. But, on the day of the meditation Karan received a call, that on the way to the meditation venue they met with an accident and they could not come. The accident was minor, now they both are fine. But, Karan feels sad at the same time surprised with divine game plan. 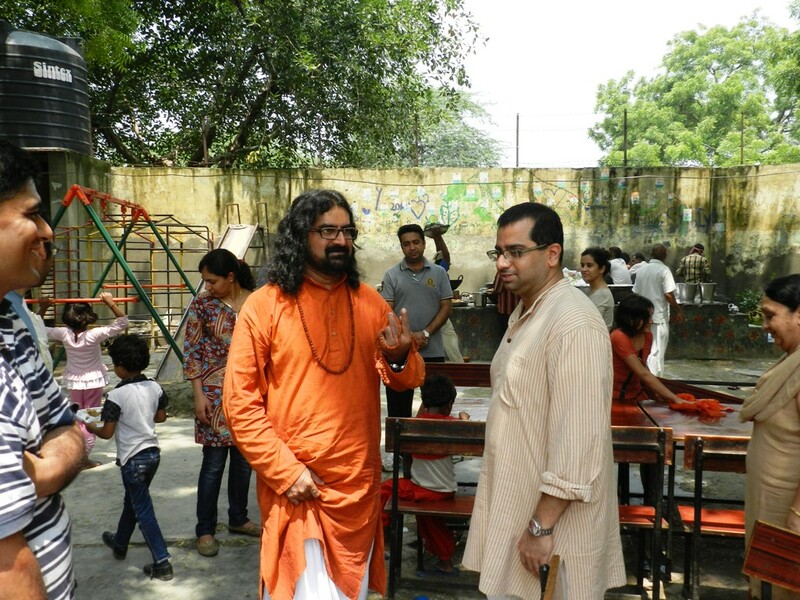 Karan writes, “All of us were in full swing for preparing the place for Mohanji’s arrival. As he arrived and I saw him getting out of the car, my heart started pounding, as if it would jump out. I touched his feet, he hugged me and there it was, as if I got everything! My heart filled with all emotions I was holding, a Master spreading his arms to hug me, what else could I ask for. Something inside told me “That’s it Karan, your life is no longer the same as it was 5 minutes back” …and now if I see it, it is not. The Meditation started and I was sitting in the second row from the front, right in front of him, in peace and silence. Those 50 minutes went by in no time as if it started and finished. I was back to my work taking care of certain things which I was there for. After the meditation Mohanji gave Shaktipat to everyone individually and that was such a wonderful scene to witness, Master sitting and blessing us all with his hand on our heads, WOW!! It was now my turn to take Shaktipat. I had been waiting for this moment, I would not mind saying again, Master sitting and blessing us all with his hand on our heads, WOW!! He blessed me, gave me sweets as Prasad and his picture, and as I was getting up, he gave me two more pictures of his, saying “there are two people who are looking for your attention”. I just stood still and was about to ask who are these people but before I could complete Mohanji said “They will find you and you will know.” A few days later Mohanji left Delhi and I got back to my job. I was on a flight and here I met my colleague devastated with his life in all aspects, and suddenly I got a guidance that he is the one the first picture has to go to. So I quickly took the picture out from my bag and told him how this picture came to me and now it’s yours. He was in silence, feeling completely blessed. There it was, Masters beautifully operating through me and guiding how and what to do. Smriti says, “During the first meditation session my mind kept playing a lot. It was so difficult to focus that I almost gave up, but something in me kept telling me ‘It’s ok, just watch your mind’. When I went up to Him to receive Shaktipat, I didn’t say a word, not even when others shared their experiences. He told me a few things and suddenly added ‘just watch your mind’. SAME WORDS! He knew it all, and so lovingly He was guiding at every minute. Not just to one but to each and all, at their own respective levels and issues”. Meditation conducted 2 sessions. Response was very good from everyone. People openly asked questions to Mohanji and He willingly cleared their doubts. Later on, everyone proceeded for dinner at Phaneendar’s residence. Mohanish has a vital observation here. He says, “By the time dinner was ready each of us was slowly and steadily settling in silence. A couple of us had trouble settling down because intense churning was simultaneously happening within us. We could not remain aware of our spine and so some of the churning spilled out in the form of anger, irritation, introversion, and over-excitement. Those with whom this understanding was available remained silent and observant. So all of us were learning at our respective levels of maturity and everyone was growing. Mohanji’s love and dedication was visible in everybody’s attitude. One of the guests even walked up to Sumit after the session and said how touched he was to see the seva bhaav being nurtured in Mohanji’s family. 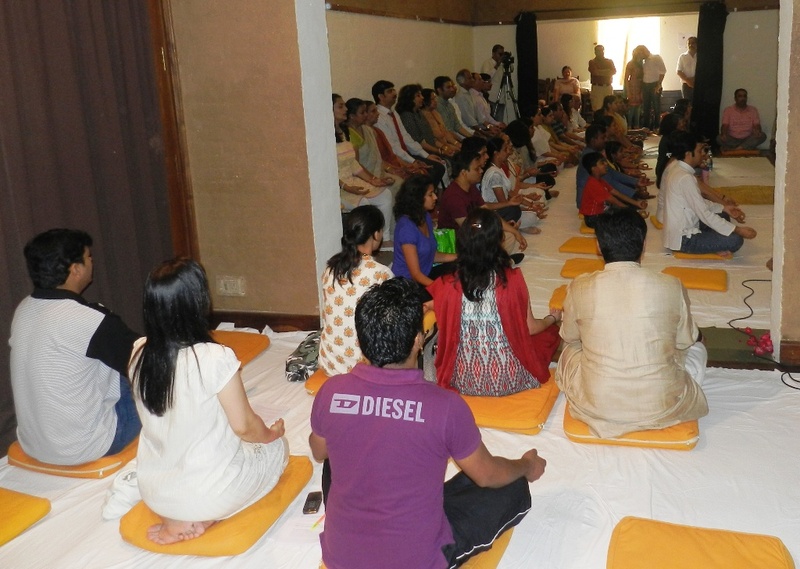 Second meditation in Delhi was conducted at The Attic, Connaught Place on 20th August 2011. Karan, Smriti, Yamini, Varun, Joga and Aparrna reached the venue early in the morning. Smriti and Yamini beautifully set up the venue, the altar and arranged flower rangolis to elevate the energy of entire place. It was touching to see how all volunteers and initiates alike were picking up and arranging the shoes, picking up litter instead of asking someone else. Mohanji’s love and dedication was visible in everybody’s attitude. One of the guests even walked up to Sumit after the session and said how touched he was to see the seva bhaav being nurtured in Mohanji’s family. Karan adds, “The seats for meditation were full and were still receiving calls. More people wanted to come. So my wife, sister and I gave our seats to other people. As before, who had to come, had to come, and we were being taken care of by the Masters. My heart was filled with love, seeing so many people, in communion with the Master! WOW!”. The meditation went very well. People had some beautiful experiences. Some of them had a complete 360 degrees vision or the experience of oneness with the Universal energy. A girl had an experience in which she was saw Mahavtar Babaji and all the Masters of the Kriya Yoga lineage within Mohanji. After the meditation, people asked questions and Mohanji was answering them. Karan says, “I was getting so many messages and learning for myself as if these question and answers were just for me. I felt really blessed again. The day ended with a lot of blessings and Love”. 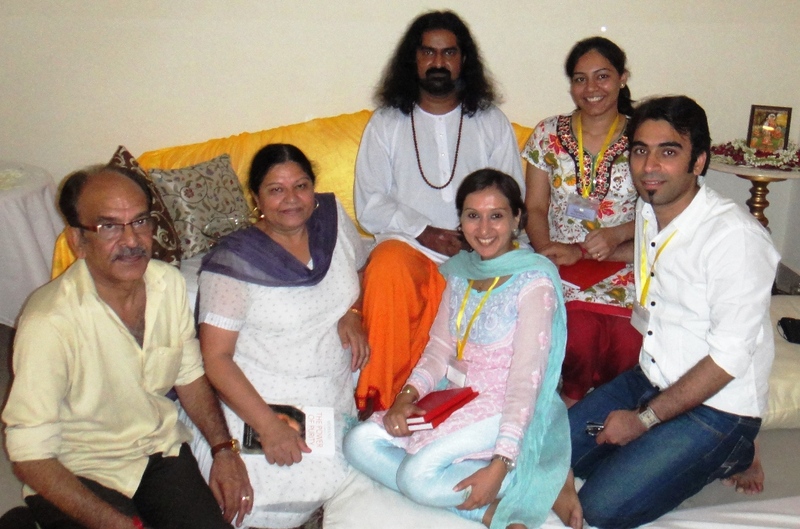 After the meditation, everyone (all organizers) went to the guest house arranged by Varun and Mukesh Sabarwal. After Sattvic lunch and Prasad, there was very informal and heart to heart session with Mohanji. Mohanji shared stories from his life, his experiences, was cracking jokes – it was reality which felt like a dream, wishing it would never end. Sumit says, “It was full of love to discuss almost anything and everything with Mohanji openly, just like a family get-together. The Master was very relaxed and to make us comfortable, he actually came to our level to express his love”. Kilkari is an orphanage housing around a 100 destitute female children. Another 100 girls from Khushi home at the faraway Kashmiri Gate were brought here by bus. In the second group are some badly battered and abused children, exploited, left alone and forgotten by the society. 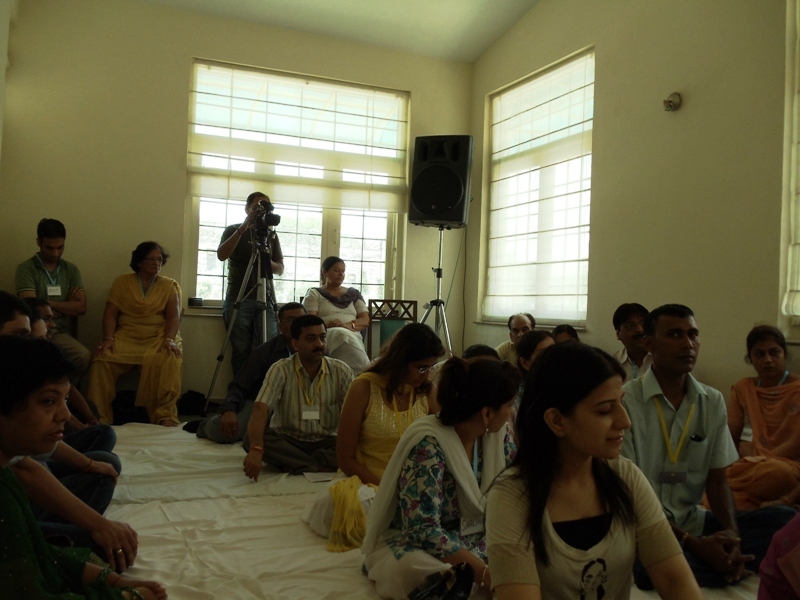 Meditation was conducted in two sessions. All preparations were done by the Delhi team. It was a small room with around 100 girls sitting very close together. For Karan it was a beautiful sight to see how suddenly peace and calmness took over in the room filled with these children with Mohanji’s entry into the room. Though it was tough to teach them breathing exercises initially, they learned quickly. Individual Shaktipat was given by the Initiates. Many of them fell into peaceful sleep, having experienced such high energy and love for the first time. After the session, Mohanji gave shaktipat individually to every child. In the middle of shaktipat being given, the next batch of children arrived and they were settled. There were three back to back sessions. 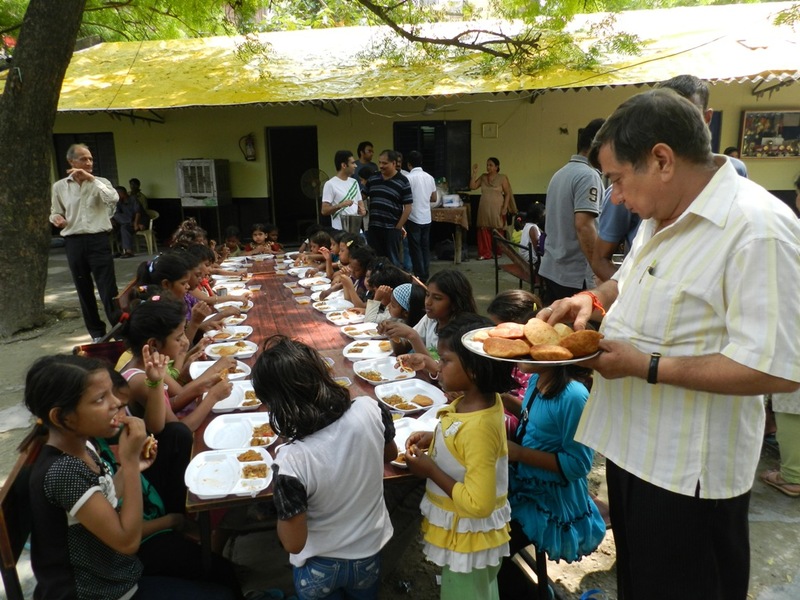 As soon as the first session ended, the second group was brought in, and simultaneously the ‘Ann-daan’(lunch) started for the previous group after Mohanji had blessed the food. When Mohanji as the head of the family is so dedicated on the Path of Dharma, it touches us and inspires us to walk the path more steadily and with more clarity. Those who had attended the meditation in Delhi or Gurgaon earlier, and were highly touched by the experiences, came on their own to the orphanage to witness and volunteer in this ‘Seva’ happening on such a large scale. By the time the second session ended, the third began (food being served outside to the previous batches). Those who had attended the meditation in Delhi or Gurgaon earlier, and were highly touched by the experiences, came on their own to the orphanage to witness and volunteer in this ‘Seva’ happening on such a large scale. What they witnessed was Master showering his grace equally and unconditionally on everyone, be it the cream of society in a farmhouse in Gurgaon, or this group of destitute children in a remote corner of the city. The Master was the same everywhere, serving, loving, and always giving HIS best. Smriti genuinely adds, “Mohanji saw God in all forms. He blessed all; He shared love and smiles with all. Be it in the comfort of air-conditioned halls or in the heat of only lightly lit hall in the orphanage, there was NO CHANGE whatsoever! SO MUCH TO LEARN FROM HIM! Beautiful art of serving people, unconditionally! After the children had food, they were given goody-bags by Mohanji. We recently received the feedback from the caretaker at the orphanages that on that day, many children had experienced their parents’ hands on their heads when they received the Shaktipat. Now they have requested for these sessions to be held there once every month. One was recently held by Smriti on 5 Oct 2011. Mohanji lovingly expresses gratitude for all, “Many children were calling me father. They were seeing their father in me. I heard some small children talking amongst themselves, “this is our father”. And many of them came and asked me, when will I come back? I said “pretty soon”. Indeed, all of us could at least bring some smile in their faces and that makes our lives worthwhile. Right? There was one small girl with her face burnt and disfigured. A good soul. She waited patiently until her turn came. She kissed my hand and cried, calling me father! When I was sitting in a chair, outside, one small girl came from behind and hugged me. So much love was flowing from all hearts. In fact I must thank all the organizers – Sumit, Smriti, Karan, Phaneedhar, Bindu, Lavanya, Rajeshwari, Pradeep, Shashank, Mohanish, Moushami, Daddoo and others, for giving me this privilege. They are great souls, selfless people. I am sincerely thankful to them”.